Here we will prove that if two sides of a triangle are unequal, the greater side has the greater angle opposite to it. To prove: ∠XYZ > ∠XZY. Construction: From XZ, cut off XP such that XP equals XY. Join Y and P.
2. 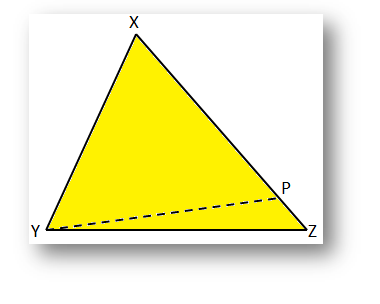 In ∆YPZ, exterior ∠XPY = Sum of interior opposite angles, ∠PZY (=∠XZY) and ∠PYZ. 3. Therefore, ∠XPY > ∠XZY. 4. Therefore, ∠XYP > ∠XZY. 5. But ∠XYZ > ∠ XYP. 4. Using statements 1 in 3. 6. Using statements 5 and 4. Note: The angle opposite to the greater side in a triangle is the greatest in measure.